Is dinner just over this dune? 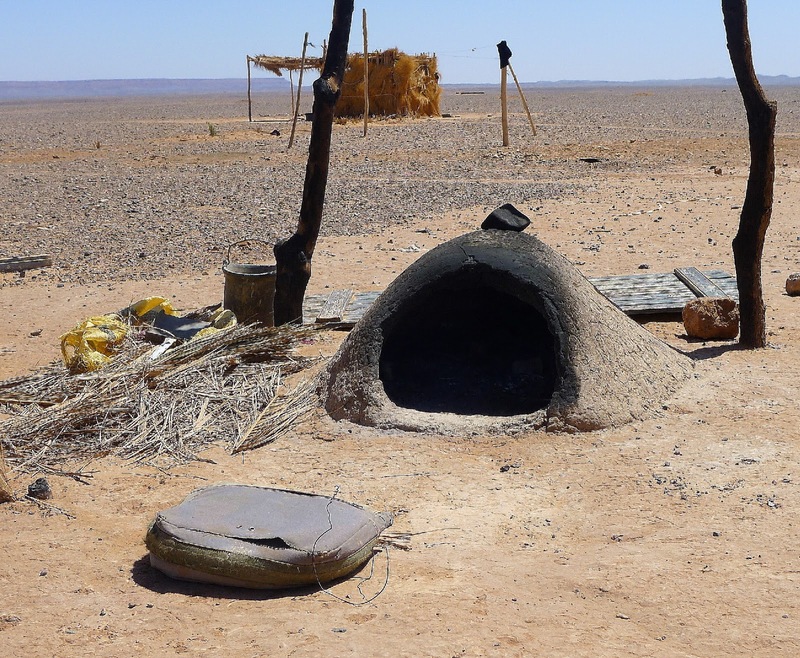 A good spot to set up a cookfire, in the shade of a tamarisk tree in the sandy desert. 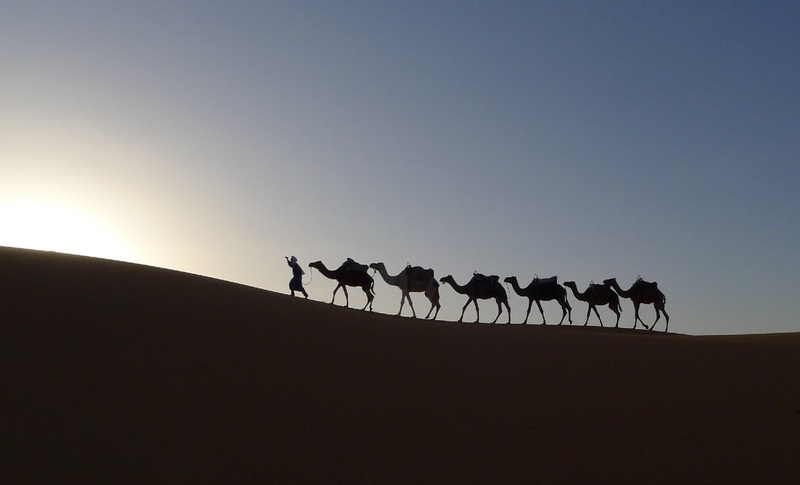 Your caravan of dromedaries comes over the golden dunes. You set up the jaimas. In the shade of a tamarisk tree, you start a fire in a sand pit with palm fronds and dry brush. Pat out the bread dough. Spread with filling, top with more dough. Set the filled pie in the hot sand. Push coals over the top. And wait while the bread bakes. Brush off all the sand, slice and serve to your nomadic Berber family. 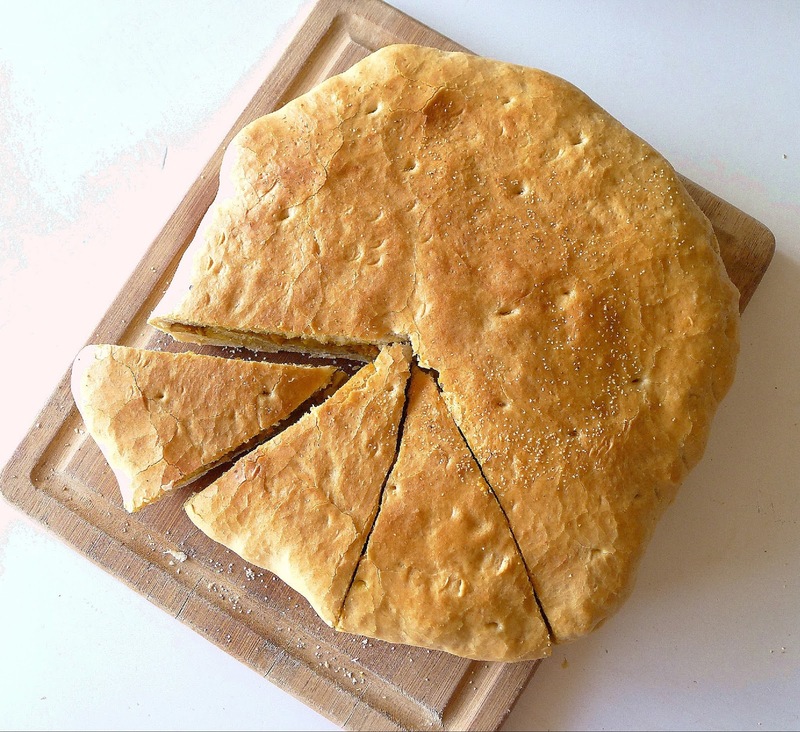 Berber “pizza,” it’s called, although it’s more like Spanish empanada, with thick, bready crusts. I first tasted it at Café Nora at the desert village of Khamlia in Morocco. There owner Hassan and his family prepared and served the pizza in an air-conditioned dining room carpeted in colorful rugs. At Café Nora, the filled bread is baked is a pizza oven fueled by bottled gas. We returned another day at sundown to see how nomadic tribes prepare the bread in the desert sands. Hassan starts the fire in a shallow sand pit. Hassan pats out the bread dough on a clean cloth. He spreads the dough with filling, tops it with another round of dough and crimps the dough to enclose the filling. Hassan brushes away the coals and sets the filled bread on the hot sand. Coals are pushed on top of the bread, completely enclosing it. Daughter Amine kneads dough for her own pizza. so, he adds more twigs to the fire to finish the baking and sets a teapot to heat in the coals. No repast is complete without mint tea. Moha, our guide, pours tea. When the pizza is done, Hassan removes it from the coals and carefully brushes away any sand clinging to the crust. 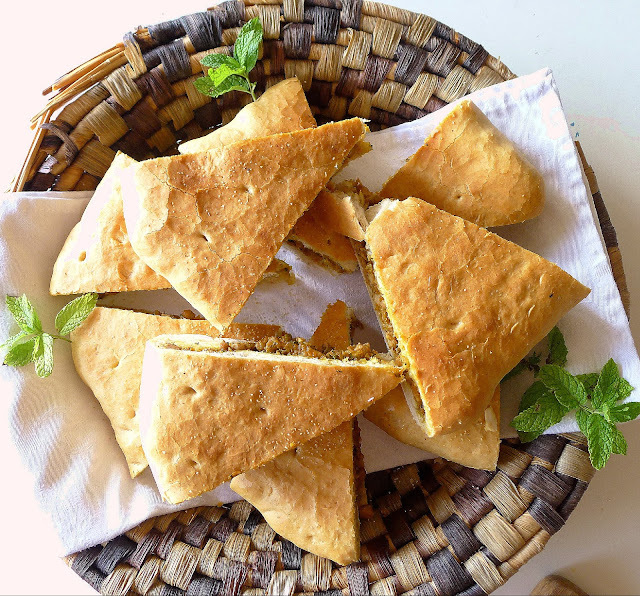 Now Amine's small breads can bake in the hot sand. The pizza smells divine--smoky bread, spicy meat filling. A desert feast. 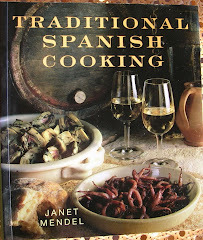 The recipe, from my kitchen in Spain, where it was baked in an electric oven. 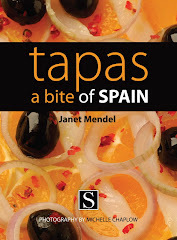 All photos, text and recipes ©Janet Mendel. The filling can be made with chicken, beef or lamb. For a vegetarian version, increase the quantity of onions to 3 cups and use three carrots instead of two. Ras el hanout is a spice blend that flavors the filling mixture. If you don’t have the real thing, mix 1 teaspoon ground cumin, ½ teaspoon ground coriander, and ¼ teaspoon each of grated nutmeg, ground ginger powder, cardamom, cinnamon, chile powder, black pepper, allspice and 1/8 teaspoon turmeric. Use 1 teaspoon of the mixed spices for the filling. 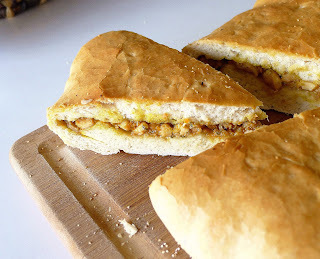 The recipe for the pizza dough is the same as for Moroccan bread, which is baked in flattened round loaves. Bread may have anise seed or sesame seed kneaded into it. Use a sharp knife to chop the chicken into small dice. Place in a bowl and sprinkle with salt and pepper. Heat the oil in a skillet and add the chopped onion and garlic. Sauté until onion just begins to brown. Add the carrots and cook 5 minutes more. Add the minced chicken, stirring until it loses its pink color. Chicken does not need to brown. Sprinkle with the spice and 1 teaspoon salt. Add the parsley and water. Cover and simmer, stirring occasionally, until chicken is tender and liquid reduced, about 20 minutes. If a lot of liquid remains, uncover the pan and cook off the excess liquid. Filling may be prepared in advance and refrigerated until ready to bake the pizza. Bring it to room temperature and stir in the fresh mint before filling the pizza. Place the flour in a large bowl. Add the salt and dry yeast and mix. Make a well in the center of the flour. Add 2 tablespoons oil and 1 ½ cups warm water. Use a large wooden spoon to mix the liquids into the flour. Add enough additional water to make a soft dough that can be easily gathered into a ball. Turn the dough out on a board and knead it until glossy, smooth and stretchy, about 10 minutes. (Dough can be kneaded with dough hook of an electric mixer.) Gather the dough into a ball. Clean out the bowl and oil it lightly. Place the ball of dough in the bowl, turning to coat it on all sides with oil. Cover with a dampened cloth and put in a warm, draft-free place to rise for 2 hours. Separate about one-third of the dough (a piece of approximately 13 ounces). Roll it into a ball and set aside. Gather the remaining dough into a ball. Place it on a clean kitchen cloth. Pat it into a circle. Roll, pat or stretch to make a large disc, about 14 inches in diameter. Spread the filling on top of the disc. Roll the smaller ball of dough to make a 9-inch disk. Place it in the center of the filling. Wet the edges of the bottom disc with water. Fold them up to meet the top disc and crimp to enclose the filling. Invert the filled pizza onto a baker’s peel or a rimless baking sheet sprinkled with semolina, so that the crimped dough is underneath. Pat it to flatten slightly. Prick holes in the top with a knife or skewer. Let the pizza rest, covered with a damp cloth, 15 minutes while heating the oven. Preheat oven to 400ºF. If using a pizza stone or earthenware slab, preheat it in the oven. Slide the pizza onto preheated stone or place the baking sheet in the oven. Bake until crust sounds hollow when tapped, about 25 minutes. If desired, finish the pizza under the broiler to brown the top, 5 minutes. Remove the pizza and brush the crust with oil. Cover with a cloth let set 10 minutes. Slice and serve the pizza. It's good hot or room temperature. 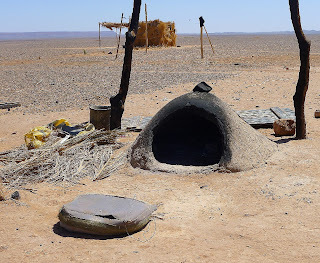 An oven in the desert, where bread is baked daily. 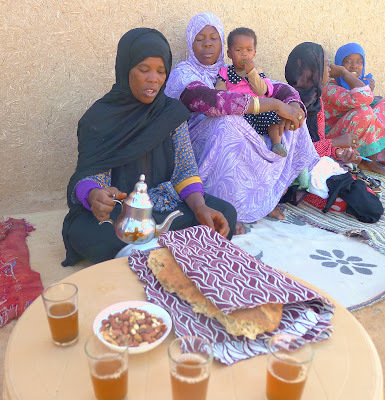 A desert family serves us fresh bread and mint tea. 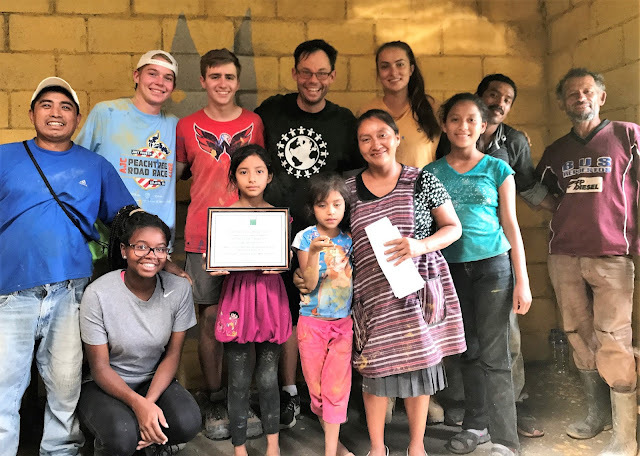 I'm going to be away for a few days, so I've invited a guest blogger this week--my son, Daniel Searl, who is a Spanish teacher and Director of Hispanic Student Development Equity and Inclusion at Westminster School in Atlanta, GA. Twice a year Daniel is one of three faculty members to lead a group of Westminster students on the Guatemala Global Education program. 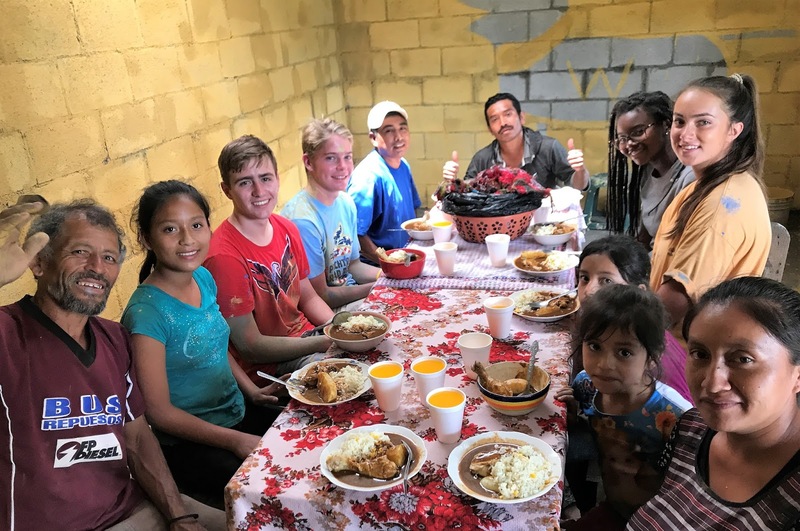 During a nine-day stay in Antigua, Guatemala, using materials purchased through fundraising, students work with Guatemalan families to build affordable and safe homes. The homes are part of a wider campaign, in partner with From Houses to Homes, to connect families with educational, health care, and housing opportunities. Key delivery for a new home with a real roof to this family in Guatemala. Students from Westminster school collaborated in the building. Faculty advisor, Daniel Searl, is in the center, wearing the black tee-shirt. Not all is bricks and mortar, though. The kids also enjoy a trek to nearby volcanoes, cycling, sports events with Guatemalan students and even cooking classes. 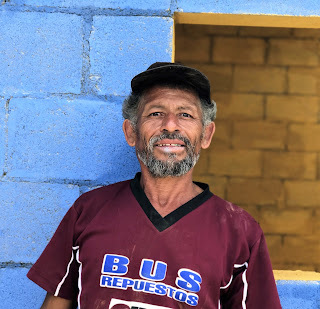 The completion of each simple, cement block house is celebrated with key delivery to the recipient family and a communal meal as sumptuous as a Thanksgiving feast. 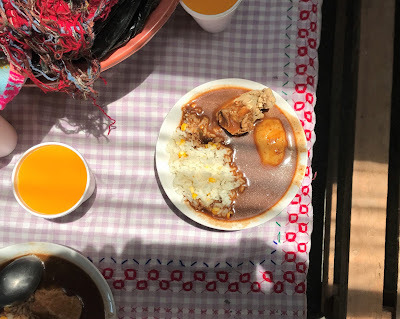 Daniel sends photos from this summer's Guatemala trip and a recipe for pepián, considered the national dish of Guatemala. Students and family share tortillas and a feast of pepián, a typical Guatemalan dish with chicken and chilies. El Señor Max is the man of the 'new' house. A proud man who worked his tail off everyday, all day, building his new home. 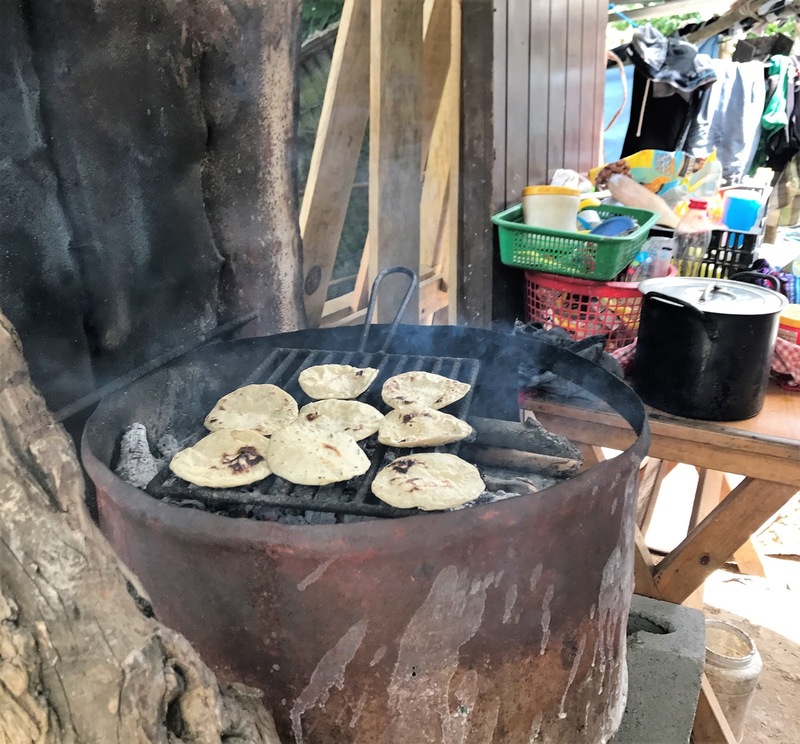 Corn tortillas cook on an outdoor brazier. The feast is ready--bowls of pepián with chicken, pumpkin seeds, chile-inflected sauce, and rice. 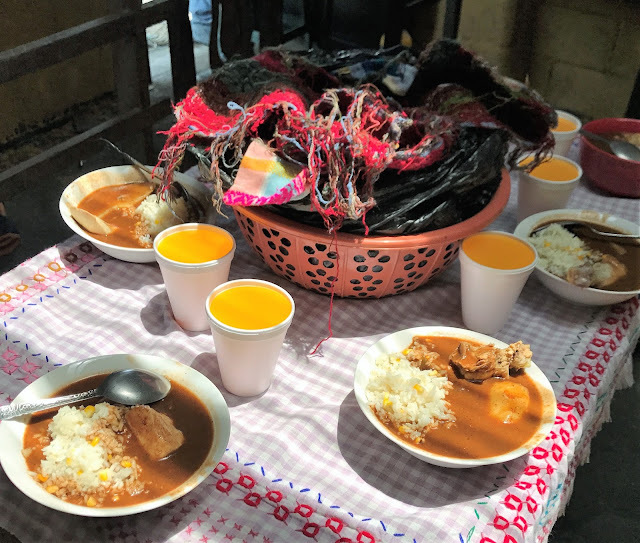 The centerpiece is a basket of warm tortillas wrapped in a colorful woven huipil. The newly constructed house has a skylight that beams light onto the table. Cut whole chicken into 8 or more pieces. The chicken can be cooked skin on or off, as preferred. The bones are included and add flavor to the dish. Boil chicken in a stock pot in roughly 3 liters/quarts of water. Water should cover the chicken by about 2 inches. Add 1 heaping Tbsp salt and ¼ onion to the water while the chicken boils. While the chicken is boiling, roast in a heavy skillet or plancha the dried chilies (de-seeded and de-veined) over a medium low flame until very dry and fragrant. Once roasted, crumble chilies into a mixing bowl. All roasted ingredients will be combined in this bowl. Roast raw pumpkin seeds until toasted. Add to mixing bowl. Roast sesame seeds until lightly toasted. Add to mixing bowl. Roast one whole onion cut into sections with black peppercorns, cloves and garlic. Toast fresh cilantro on stovetop in a skillet the same as the other ingredients. This will become very fragrant. Add to mixing bowl. Roast tomatoes. These take the longest to roast. They are likely to become black but should be roasted until soft. Add to mixing bowl. Roast 1 Tbsp dried oregano. Add to mixing bowl. Roast ½ stick cinnamon until dry and fragrant. Add to mixing bowl. In a separate bowl cut peeled potatoes into large chunks. Cut qüisquil into thick slices and peel. Cut remaining onion into chunks. Add these to the chicken pot once chicken is almost cooked. Combine all roasted ingredients and add 3 ½ cups water. Blend liquid and roasted ingredients in a blender to combine fully. Add the mixture to the chicken pot. Continue cooking at a rolling boil, adding the vegetables part way through cooking, until the sauce reduces and all ingredients are cooked through. The sauce is typically like a thick soup. 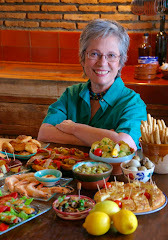 Serve with cooked rice and corn tortillas. Javier López in the Bodegas Hermanas López Lavado, Mijas. Javier López is a winemaker and he’s making really good wine. His is the first bodega (winery) in 138 years to be established on the Costa del Sol, a touristic region in southern Spain. The bodega and the vineyards are located in the village of Mijas in the province of Málaga, The wines’ label, Viña Tamisa, comes from the Roman name for Mijas. Mijas is my pueblo, where I have lived for the past 50 years. Which is why, when I heard about wine being produced in my own village, my curiosity was piqued. The vineyards are less than a mile from my home, yet I never knew they existed. It was when I attended a cata, a tasting of the wines of Bodegas Hermanas López Lavado that I got excited to know this young winemaker in my community. A day before the vendimia, grape harvest, vineyards near Mijas (Málaga) on sloping land with views to the Mediterranean. Javi’s plan when, in 2004, he planted 100 vines on a sloping plot of land just below the village, was to bring back wine-making to Mijas. Mijas, historically, was one of the most important wine-producing districts in the province of Málaga The municipality, which stretches from high sierra to river bottom to the shores of the Mediterranean, had hundreds of vineyards. Almost every small farmstead had a wine press and the wines were exported as far away as England. But in Mijas, landowners replanted in olives, wheat, citrus, and, in recent years, avocados, golf courses and tourist resorts. Grapes were grown on an arbor on the patio for consumption fresh, not for making wine. Javi grew up in a Málaga family connected to wine making there and claims he was interested in wine making from a young age. 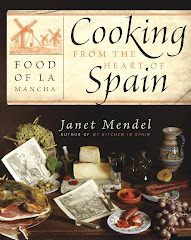 He married a Mijas girl, Ana María Lavado, and moved to the village. Ana María’s family had grown avocados on a finca below the village for two decades, but lost the entire plantation in a drought in the early 2000s. Javi’s father-in-law put up the land for the vineyards as well as his garage in town, where the bodega is located. The winery is named for the couple’s two daughters, the hermanas (sisters) López Lavado. 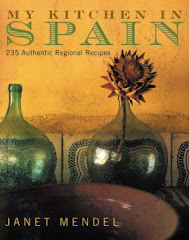 Is there a Mijas terroir? Javi absolutely believes so. "La tierra tiene memoria," he says.The land remembers. It has a unique geography and climate. Mijas was once a great wine producing region and it promises to be again. 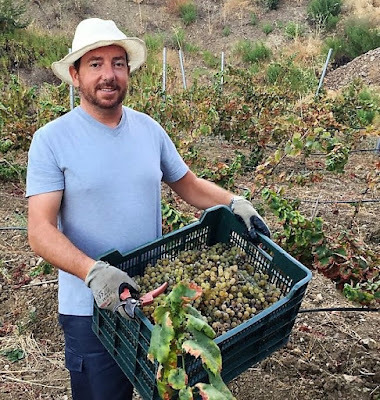 Javi learned the basics of viticulture and vinification in a two-year professional course at the Instituto Las Viñas in Manilva, a Málaga town known for its wine and raisins. But, in addition to training, it takes instinct, experience and passion to create good wine, Javi says. Javi’s day job is as a police officer. He works a five-day week, from 8 to 3 in the afternoon. He comes home after work, hangs up his uniform, and heads to the bodega or to the vineyards. “I’ve learned to compartmentalize my life,” he says. Summer into fall is the busiest time, preparing for the vendimia, readying equipment, monitoring the progress of fermentation, finally bottling and labeling. Although production is limited by the size of his garage-bodega, Javi has launched his wines commercially. 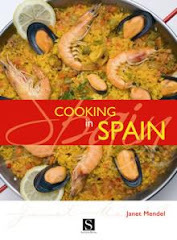 So far they’re available in a few select restaurants and wine shops in the Málaga region. Javi says he has saved and sacrificed in order to finance the bodega operation but has no plans to expand. He needs to sort out the bureaucracy of legal certification as a vino de la tierra, “wine of the land” for Viña Tamisa. He can’t join up with the Denominación de Origen Málaga, because the Mijas bodega is geographically outside its legal parameter. The vendimia (grape harvest) came very early this year. 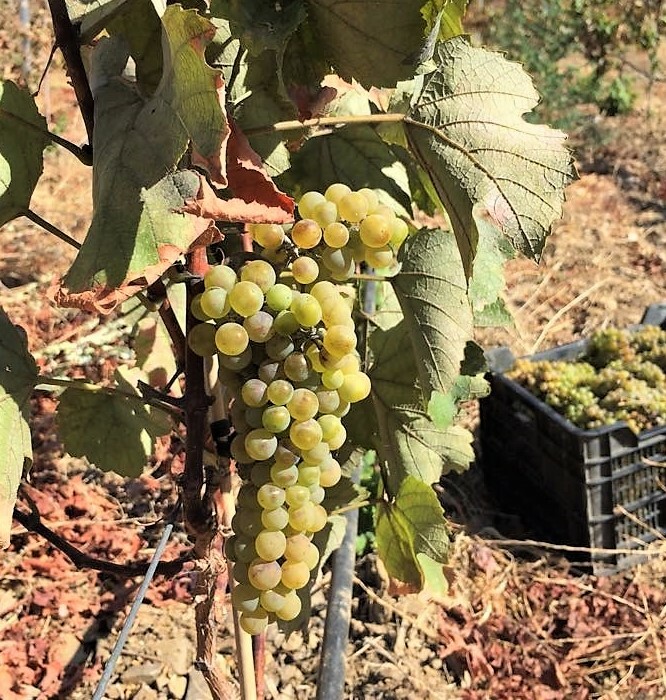 On August 5 Javi and a few friends were up at dawn to hand-pick the Chardonnay grapes. 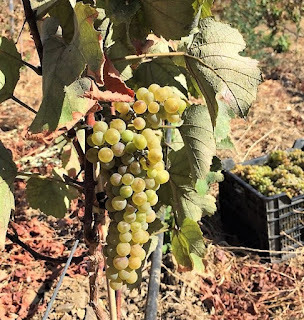 To decide the ideal time for harvest, he uses traditional methods of testing the grapes’ sugar content as well as biodynamic charts showing when the alignment of sun, moon and planets will contribute favorable energies for the harvest. In the bodega, Javi combined the Chardonnay with Moscatel (bought from vineyards near Málaga). Javier López in his vineyards. Tempranillo (red) grapes also were early (August 22), but the Syrah from Javi’s vineyards is late maturing, still to be picked. He also buys grapes--Muscatel, Petit Verdot and Syrah--from other growers. After picking, the grapes are quickly chilled to preserve their freshness and prevent run-away fermentation. Then it’s all hands—friends and family—for the vinification process. I joined the team in the Mijas bodega as crates of blue-black Tempranillo grapes were unloaded through the garage doors. A family friend, Cristobal Moreno, helps unload crates of Tempranillo grapes. Sweet, ripe Tempranillo grapes, ready to become wine. Javi and a friend climb onto a platform alongside the despalillador, the machine that removes stalks and stems from the bunches of grapes. Another helper lifts the crates up to them. Javi picks out any bunches that appear damaged or under-ripe and drops them into a box below. Village friend, Miguel Romero, checks the connections of the pipes that pump juice into the stainless deposit tanks. On one side, Ana María Lavado, Javi's wife, monitors the flow of grape juice and pulp that begins to pour out of the machine. The juice is pumped into a stainless steel, temperature-controlled tank, where it will undergo the first, alcoholic, fermentation. On the other side, the woody stalks are pushed out. They will later be carried to the vineyards for composting. María, left, and Ana, the two hermanas López Lavado, join the mopping brigade. Miguel Romero, Jr., draws off a glass of mosto, the first sweet grape juice. The grapes are not crushed, but slowly release their juices from their own weight. The whole process—resulting in about 2500 liters of mosto, grape juice and pulp—takes only about 45 minutes. At a later time, the wine will be pumped off the sediment and the lees will be pressed to squeeze out the last, concentrated juices that add potency to the wine’s organoleptic profile. Javi gives us a peek into a deposit tank where the Chardonnay-Moscatel wine, processed several weeks before, is bubbling and frothing. It’s in the second, malolactic, fermentation that changes the fruit’s malic acid into smooth, creamy lactic acid. Once it stops bubbling, he’ll keep it hermetically closed to prevent oxidation until he’s ready to bottle it. The Tempranillo has a way to go yet. Javi needs to decide if it’s going to be bottled joven, as a young wine, or as a crianza, with time in oak barrels, and if he will make a single-varietal Tempranillo or a coupage, combining the Tempranillo ,with Petit Verdot and Syrah, yet to come. “Normally, I know before picking whether the grapes will be joven or crianza,” he says. He keeps a daily log of lab analysis of sugars, temperatures, humidity. “It takes instinct and experience to produce fine wine." For young wine, he picks early to keep the grapes’ freshness and acidity. A crianza needs fully ripened grapes to give enough sugar to develop the wine’s expressive characteristics during fermentation and ageing. This year’s Tempranillo, he thinks, will work best in a coupage with Syrah and Petit Verdot with crianza time in barrels of new French oak. Although production is limited by the size of his garage-bodega, Javi has launched his wines commercially. So far they’re available in a few select restaurants and wine shops in the Málaga region. “I think I make good wine,” he says. He is gratified when knowledgeable wine experts think so too. Javier López presents Viña Tamisa at a cata, wine tasting. I first tasted the Viña Tamisa wines at a cata, wine tasting and pairing meal at a Mijas restaurant, La Fiesta. I tasted an elegant, structured Petit Verdot rosado (rosé) that had five months on oak. It had an intense pink color and paired beautifully with a shellfish timbale. Next was Viña Tamisa Tempranillo-Petit Verdot-Syrah from 2014, with one year on oak and one year in bottles. The aroma of this tinto (red) opened-up with some swishing, releasing lovely fragrance of ripe woodland fruits, a touch of coffee. The intense flavor went nicely with tuna tataki. Finally, we sampled Viña Tamisa Syrah, the first of Bodegas Hermanas López Lavado to be almost entirely produced with biodynamic methods, creating an expressive wine with more aroma, black cherry color, aroma of ripe fruit, a touch of chocolate, a long finish. The unfiltered wine had 16 months on oak and 12 months in bottle. Javier López is very proud of this wine. Contact Javier López at bodegaslopezlavado@gmail.com . Visit the Facebook page of Bodegas Hermanas Lopez Lavado. Viña Tamisa vineyards planted in Tempranillo grapes.